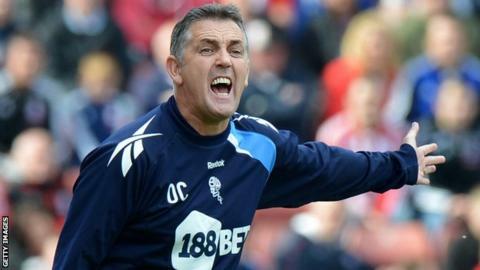 Owen Coyle insists he has left Bolton in good shape to win the Championship under new manager Dougie Freedman. Crystal Palace have confirmed that Freedman has left them to replace Coyle, who was sacked on 9 October. "I don't want to sound too big-headed here, but I've done all the dirty work," Coyle told Radio 5 live. "The only thing that stopped us this year was real bad luck. It was very simple. But good luck to Dougie. He's a lovely lad. I know him well. Bolton, relegated from the Premier League last season, were 18th in the Championship when the former Burnley boss was dismissed. If I was a betting man, which obviously I'm not allowed to be, I'd be putting money on Bolton to win the league. "I've slashed the wage bill, as we had to do over a period of coming up for three years," added Coyle. "And they have, I believe, the best set of players in the Championship. "And if I was a betting man, which obviously I'm not allowed to be, I'd be putting money on Bolton to win the league. Palace granted Bolton permission to speak to Freedman on Monday, having initially rejected an approach. It is not yet clear whether Palace assistant manager Lennie Lawrence and first-team coach Curtis Fleming will be moving to the Reebok Stadium as well. Coyle is keen to get back into management following his exit from Bolton and believes he would be an asset to any club who takes him on. He added: "I absolutely love football. If I wasn't involved in it, then I'd be away paying a fiver to play in five-a-sides because I love the game. "What I do know is that at whichever club the opportunity arises for me, they're going to be very fortunate, because I'm the best manager I've ever been. "Yes, I accept it's been a difficult last year, but coming on the back of the work I've had to do, I'm well set to go in and take another challenge. "And that's the way football works. Everywhere I've been, I've been very fortunate to work at wonderful football clubs, and the next one will be the same. "There will be opportunities. The phone's not stopped since I left last week, but obviously I need to make sure it's the right thing for me, my staff and my family when it comes about."